The second headline indicates what it is really about how to play Commedia dell’Arte. The plot is not at all important. It is always how we act that makes people laugh, not what we do. 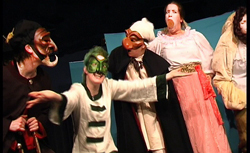 Commedia dell’Arte does not have a social message that will change the world nor is it trying to tell a story, even though the acting style is in many ways close to storytelling. See HERE. One could say that the plot in Commedia dell’Arte is just a shoddy purpose to act on stage. “Massimiano: Now let us consider the selection of actors and distribution of roles, which I think is most important. That doesn’t mean that we can ignore the plot. The plots in Commedia dell’Arte still have its own form or at least a lowest common denominator. The plots in Commedia dell’Arte, as in all Vulgar Comedy, have its origins in rites. It is the ritual that makes the plots so irrelevant for how what is seen on stage is received. Rites are built on repetition. The audience is expected to already know the plot and its development, ending, different components more or less. They demand these components, to be happy with a show. Just like when we demand that the killer will either get caught or killed by the end of an action film. In the same way we don’t expect a refined intrigue or psychological depth in the characters of the masks. What is interesting is how the mask is doing their actions, deal with their problems or show their personality. This is also why the audience can get so involved that they actually becomes a part of the show. Psychology is impossible in Commedia dell’Arte as the masks don’t have a past or a future, wish is the basics in psychology as science. The masks exist here and now. This constantly ongoing here and now is what makes them eternal. If that would not be the case, the masks would be private individuals and we would identify us with them on a personal level. Then the mask would lose their function as archetypical or as symbols for what they represent (typecasts, social functions, inner conflict and so on). The same moment the actor takes of his mask it does not exist. The plots are not built so that the audience would wonder what happens after the show is over. The masks of Commedia dell’Arte use their drives and appetites instead of psychology. They are driven by their desires, their hunger and their impulses and instincts. 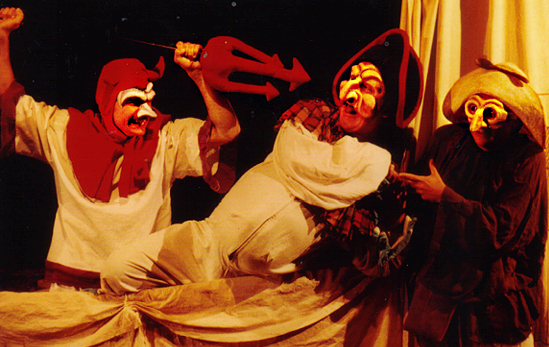 Hunger, amorousness and greed are the desires that traditionally are associated with the masks, but also revenge is a great theme in Commedia dell’Arte. Another way to put it is to say that the masks are driven by the seven deadly sins. One can say that each mask represents an aspect of the human being instead of carrying a whole human world within itself, as for, for instance the clown. And we distinguish that aspect through their physical appearance and behavior. Those aspects are simplified, magnified and one dimensional in its feelings. That is something that also helps finding the necessary distance in the play. The audience doesn’t meet real humans, that we can identify with but stereotypes that we can laugh at. This since they only represents parts of humanity, even if the world they live in is the usual world. Each show is an image of stadium or a phase in the life of a human. Off course it is possible to modernize or ad modern elements or masks in Commedia dell’Arte. We must remember that we cannot let the form limit us and that Commedia dell’Arte was not even invented as a genre at its heyday. See HERE. It is however difficult to situate Commedia dell’Arte in the modern world. Western society of today has a far more democratic and equalistic (or hypocritical if you want) way of looking at itself. A Commedia dell’Arte show can never be political correct in today’s point of view. The hilarious, grotesque and deeply wholehearted truths about the world is lost in a too prude, neat and orderly world. One exception I have found was while directing Commedia dell’Arte in India. Instead by placing Commedia dell’Arte in either the renaissance or in a world “outside of time” we can easier see the play as something going on in the inner life of the humans. It seems that people are trying everywhere to experiment with a form of Commedia dell’Arte that will be situated in the modern world. For example lots of people are trying to find female equivalents to the masks. It is hard since Commedia dell’Arte is very sexist. Pantalone is a patriarch, his body language is centered on his purse and his scrotum (wish in both Swedish and Italian is the same word). 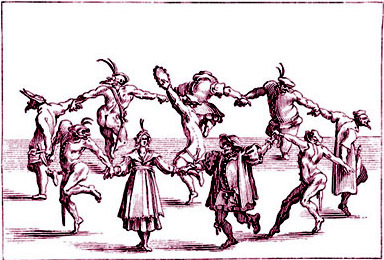 Read more about WOMEN IN COMMEDIA DELL’ARTE.